Crockpot barbecued meatballs is a flavorful and easy recipe that is delicious served over hot cooked noodles or rice. You can add some chopped onions, bell peppers, or mushrooms to stretch this dish if you'd like. This also can be served as an appetizer, with little toothpicks or tiny forks and plates. You can easily double this recipe if your slow cooker is large enough. Remember to always fill a crockpot 1/2 to 3/4 full for best results. If the food is too shallow, it may burn. If there's too much food in the slow cooker, it can overflow. Remember that foods give off liquid as they cook, even cooked ingredients such as fully cooked meatballs. All you need to add to this recipe is a green salad tossed with some sliced mushrooms and avocados and drizzled with a spicy Italian vinaigrette. Serve a green vegetable on the side, like green beans or asparagus. For dessert, some cookies fresh from the oven would be perfect. Place the meatballs in a 3 to 4-quart crockpot. Mix the garlic, ketchup, brown sugar, beef broth, steak sauce, vinegar, soy sauce, Dijon mustard, Worcestershire sauce, and pepper in a medium bowl until combined; pour into the crockpot. Cover and cook on low for 6 to 7 hours until the meatballs are hot and tender. If the sauce is too thin, combine 2 tablespoons cornstarch with 1/4 cup water and stir it into the crockpot; cook on high for 10 to 15 minutes longer until thickened. 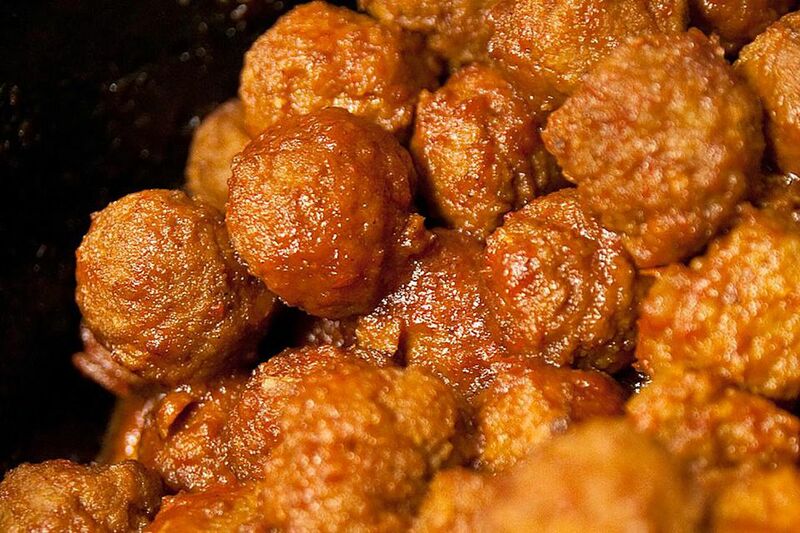 If you have a new hot cooking crockpot, cook on low for 4-6 hours until meatballs are hot and tender. Thicken as directed if desired. Serve over hot cooked rice or noodles.